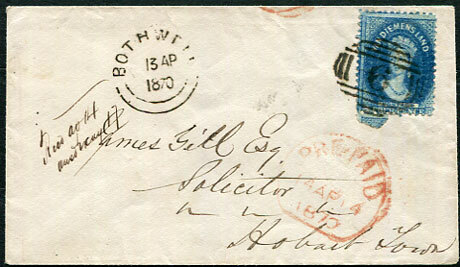 1870 cover to James Gill, Solicitor, Hobart Town with Chalon 4d tied "6" numeral with BOTHWELL 13 AP 1870 dbl-arc alongside and red Pre-Paid AP 14 arrival, no reverse markings. 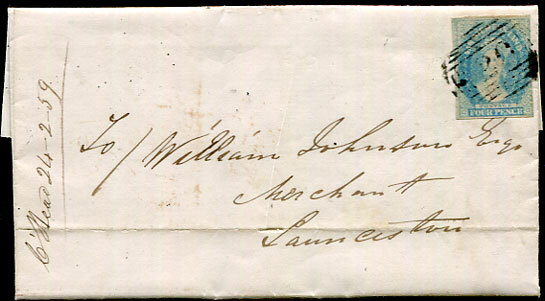 1859 wrapper docketted as from Albert H. Boys (thought to be a farmer, Detention River) to William Johnson, Launceston with Chalon 4d pale blue tied Circular Head "20" with postmaster's manuscript "C'Head 24-2/59", backstamped red Pre-Paid for same date. 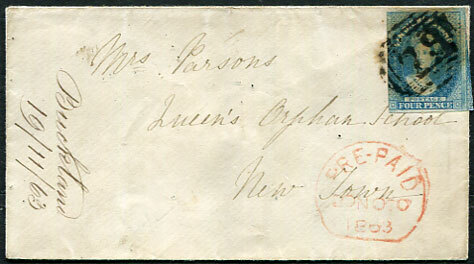 1863 cover to Mrs. Parsons, Queen's Orphan School, New Town with Chalon 4d imperforate tied Buckland "73" with postmaster's manuscript "Buckland 19/11/63" at left and red Pre-Paid NO 20 1863 at right, no reverse markings. 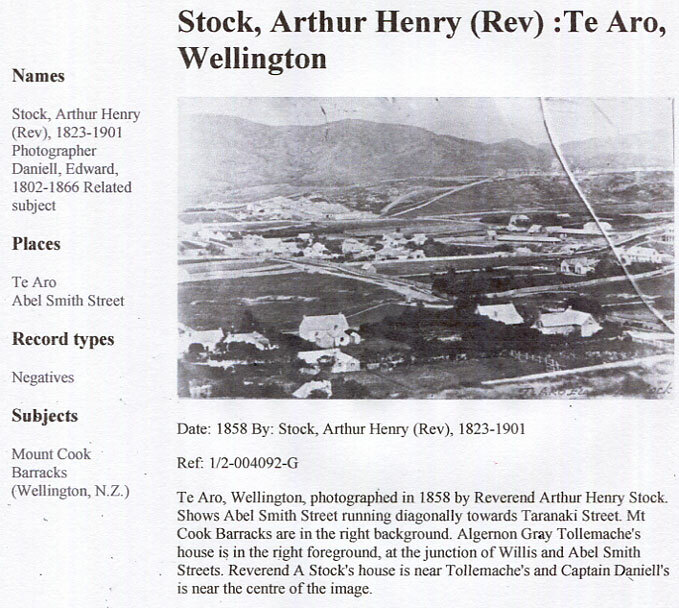 Settled in 1820 and originally known as Prosser Plains. Best known for its historic Church of St. John the Baptist, convict built in 1846, and its mysterious East Window possibly from an Abbey built by William the Conqueror on the spot that King Harold died in 1066. In the early years the majority of the children at the Orphan School, built 1833, were born to convict women under sentence. 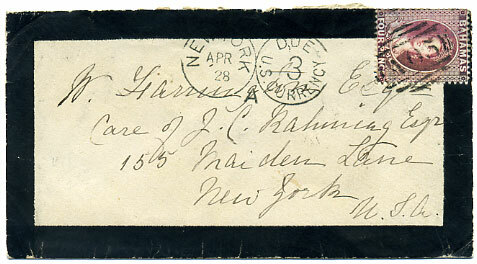 1870 reg. 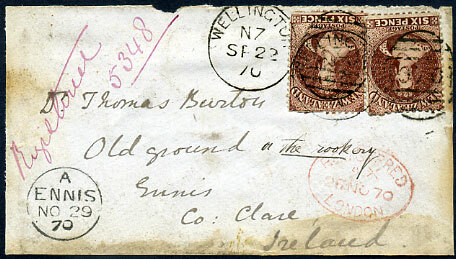 cover front with 2 x 6d tied Wellington "070" duplex to the Old ground or the rookery, Ennis, Co. Clare, Ireland showing London 26 NO 70 transit and A/ENNIS/NO 29 70 arrival. Soiled in places. 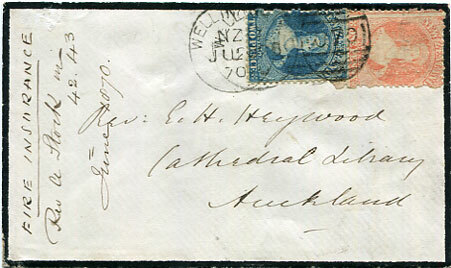 Approximately only 1 in every 100 NZ Chalon covers were sent registered. 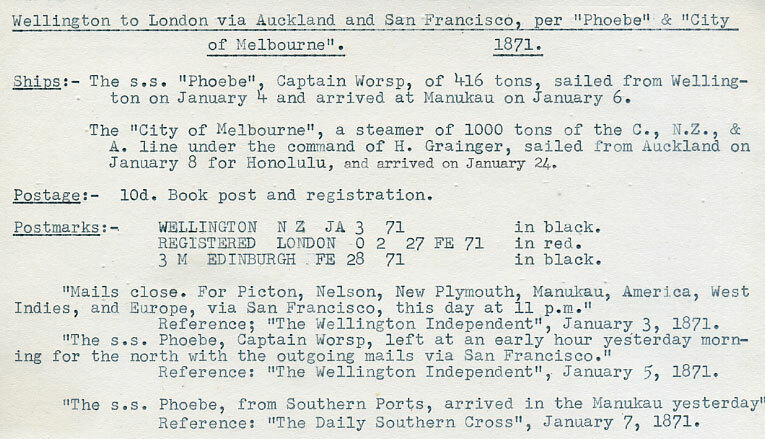 1871 opened-each-end foolscap wrapper (232 x 103mm) marked "Per Book Post to be Registered" and "via San Francisco" to Edinburgh, Scotland with QV 4d, 6d tied WELLINGTON duplex dated JA 3 71 with London 27 FE 71 transit and Edinburgh FE 28 71 arrival backstamp, some peripheral edge faults and filing crease but exceptionally rare and probably unique as such. 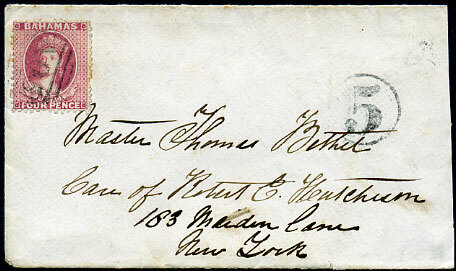 1867 cover with QV 4d dull rose CC wmk P.12½ to New York, b/stamped BAHAMAS OC 21 1867/C broken dbl-arc, slightly reduced at right on opening. Ex STAIRCASE. 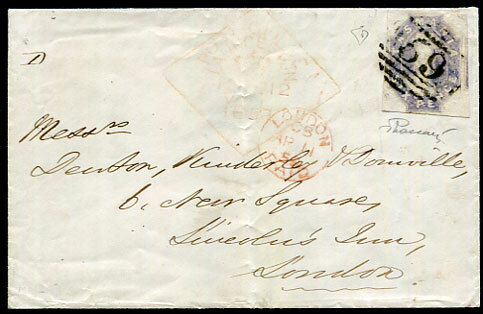 1881 cover with QV 4d dull rose Crown CA wmk P.14 (SG.36) tied "A05" to Wexford, Ireland, b/stamped A/BAHAMAS/MY 4 81 despatch cds and WEXFORD A/MY 22 81 arrival. The U.P.U. 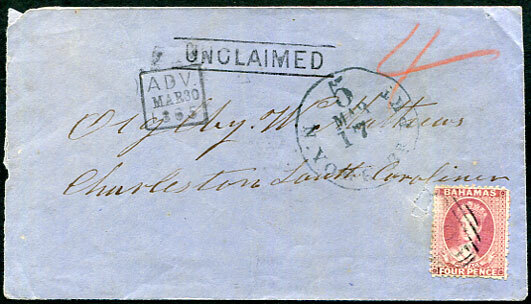 QV 4d rate (using CC wmk P.14) to UK introduced JY 1 1880, and QV 4d CA wmk P.14 issued March 1882. 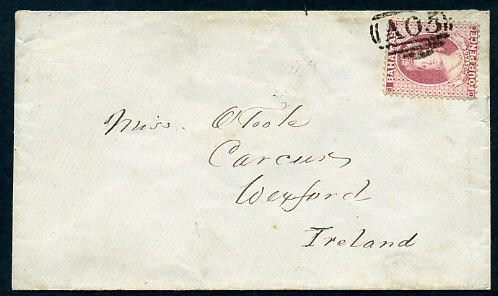 Covers with the former scarce to England and particularly rare to Ireland during this 21 month period.